Running up to the historic decisions taken in the final hours of the COP21 that took place from November 30 till December 11, the FRench hydrogen and fuel cell sector made sure that latest developments and applications were present in the Blue Zone the restricted area where all delegates gathered and only selected stands were able to demosntrate their contribution to emiussion reductions. Coincidentally with this event, Paris saw the inauguration of its first hydrogen refuelling station that will be built by McPhy whose CEO, Pascal Mauberger, also happens to be the chair of the French Association of Hydrogen and Fuel Cells (AFHYPAC). We interviewed Mr. Mauberger just before the COP21. 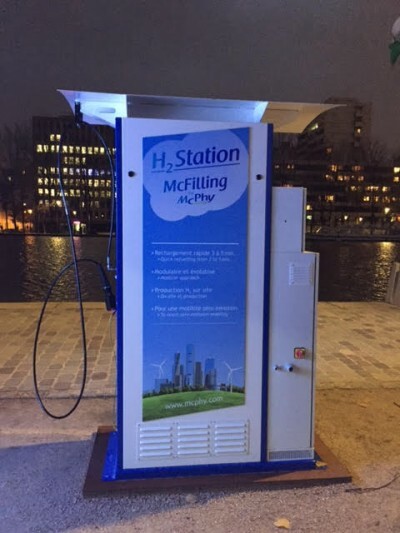 First hydrogen refueling station in Paris – a big leap for the French’s hydrogen sector. This isn’t the first station in France? Yes, there are already six other stations in France. First station was installed near Albi, South of France. There are also private stations that have been in operation for some time by Air Liquide. Then, there are those which were installed in Saint-Lô (La Manche) – the precursor territory for the hydrogen industry. One has been installed for several months and it is the first one from the deployment plan of hydrogen stations. In addition, there are two stations in Grenoble and Lyon, which were installed by McPhy. Paris’ station will be installed at Ivry-sur-Seine in the Paris’ City Technical Center. Are those stations open to the public? The stations in Lyon and Grenoble are public stations, where anyone can come to refill their hydrogen cars. Here I need to comment, that today in France we are working on deploying fleet of commercial vehicles. This deployment of working vehicles is called “Urban Freight”. There are companies that deliver packages to the city centers in such vehicles. More and more packages are being delivered in cities because of the development of e-commerce. Citizens in these cities increasingly do not want to experience polluting vehicles, such as diesel types. However, battery powered electrical cars don’t have enough autonomy for such purposes. In a typical day, a regular delivery car covers around 300 km. Whereas battery powered vehicles can only cover 120 – 150 km maximum, before they will have to return to their depot to recharge. Thus, the operators of such services cannot use battery power, as the use of these cars for a full working day requires two cars. Therefore, it was necessary to reconsider battery power for electric vehicles in order to increase their use. The solution is the hydrogen range extender. In France, Symbio Fcell is the company, which installs such systems in the Renault Kangoo battery cars. This increases their range to almost 300 km, which perfectly matches the needs of deliverers. This created an initial fleet of hydrogen cars and a hydrogen refueling station to fuel these vehicles. When you have a half dozen of vehicles running in an agglomeration, which are recharging every day with hydrogen, it allows a station operator to reach profitability much faster. That is why the city of Paris has decided to build a fleet of commercial vehicles, with a hydrogen filling station to power them. The more important point is that this station will be open to any other companies willing to use it. This station will not only be open during the conference? Yes, it will be available for years for the hydrogen vehicles of Paris. Hydrogen’s role in the energy transition is the subject, which we are working on in AFHYPAC together with the entire industrial sector. The main issue is how to develop the renewable energy sector by other means than through the electrical networks. Because we have this paradox of having more renewable energies in the energy mix, but these energies are intermittent, they are never driven by customer needs. Electricity is produced only when there is wind or sunlight. Hydrogen allows to use this electrical energy by transforming it into hydrogen gas, which is a very good energy carrier. We can store it and use in a different way than in electrical networks. One possible use, which is developing now, is in hydrogen range extenders for electric vehicles. The hydrogen station is ready to be installed. It is exposed now in the open-air free exhibition “Paris de l’Avenir” on Quais de la Villette in Paris. The exhibition will work till December 14 2015. How many cars you expect to have during following years? 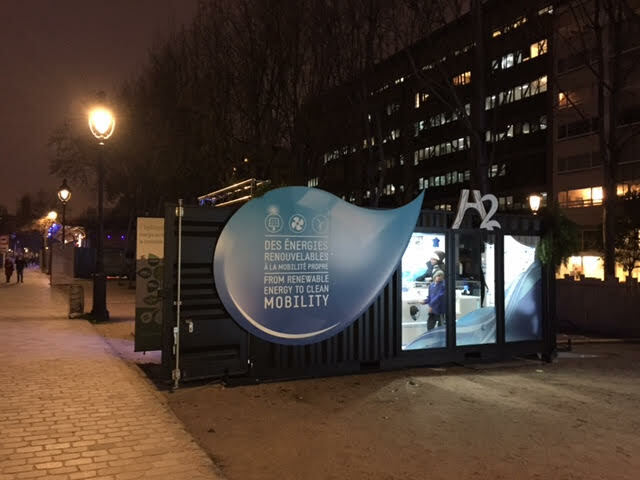 In the plan called Mobilité hydrogène France, within 10 years we expect to have up to 800,000 hydrogen vehicles operating in French territories and 600 stations to refuel them. In the shorter term, the plan Nouvelle France industrielle “Industry of the Future” is supported by the Ministry of Economy and expects the deployment of 30 fleets by 2018, with 1,000 hydrogen vehicles and hundred of hydrogen refueling stations. Do you think people will be able to buy hydrogen cars in the same way they are buying battery cars now? Yes I do. There are car manufacturers starting to position themselves in the market for private cars. Especially Hyundai, with its model ix35. Its sales started in December 2013 in California, Asia and now there are several such cars in France. Since 2014, even larger world car producer, Toyota, came on the market with its Mirai model. This is a big step forward because it is a car of very good quality, positioned by the global manufactures who gave birth to hybrid cars. Today these vehicles are still expensive. These are so-called “statutory” vehicles with a price beyond 50,000 euros. People will buy them like they now buy Tesla cars or were buying a Hybrid Lexus some time ago. However, I am absolutely convinced that companies are going to position these vehicles on the market by gradually increasing their number just as they did with the Hybrid Lexus and Toyota Prius. Fifteen years ago, such cars were very expensive, but now hybrid cars are available for everybody. I bet that Toyota, Hyundai, but also Daimler and BMW will be able to introduce these vehicles and offer customers completely ecological vehicles, which are capable of running 500-600 km between 2 refuelings and can refuel within 3 – 4 minutes. This corresponds perfectly to the expectations of people who want to have clean and non-polluting vehicles, but need vehicles with the same qualities as they were used to with regular petroleum cars. Today’s issue is the lack of hydrogen refueling stations. This is what Europe and the European Commission are trying to develop through the project of hydrogen corridors for the major European highways. They are installing hydrogen service stations every 100 kilometers. When it will be done we will have the possibility of massive deployment of hydrogen cars. What advice you will give to those who want to buy a hydrogen car? If you want to buy a Renault Kangoo in France, you simply go to the Renault dealership. The one in Grenoble has sold these vehicles for several months. It is quite easy for any company to buy a hydrogen utility car and to refuel it because we have more and more of these terminals setting up. If you want to buy Toyota or Hyundai, it is a bit more complicated. They are not yet available at dealerships. Toyota introduced the first Mirai in Japan, then in California in the United States. Their introduction in Europe will start probably in the territory like Germany, where there are more H2 stations. That is why in France we are trying to develop an infrastructure so it will not be forgotten by such commercial developments. Your station will provide hydrogen at 350 bars. Is it compatible with vehicles like Hyundai or Toyota? Yes, it is. One can refill a vehicle like Toyota or Hyundai (which are 700 bar cars) on the station with 350 bar. It will fill to about 60% of full and that will be enough to run 350 km, although refueling will be a little longer and take about 7 minutes. How large is the fuel cell and hydrogen industry in France and what are the names of the main players and is the French Hydrogen Association representing them? In the fuel cells area, there are a number French and foreign players; where Ballard is the biggest one. In France, we have Air Liquide subsidiaries and we have Symbio Fcell, which is working on the autonomy extension systems and recently they began to work with Michelin. It is very important that big players get into these technologies. Then, in the hydrogen sector, there are other actors: McPhy, Engie, Areva, but also, for example, PAXITECH, which manufactures small fuel cells to power rechargers for mobile phones. Another example is Pragma Industries, who are making fuel cell systems to power electric bikes with hydrogen. French companies cover the whole range, starting from small fuel cells up to large systems to power cars. Does the French Association presents all these actors? This is our vocation! Today we have more than 60 members. All big players that I mentioned, but it also brings together all the technological companies from this sector. Even more, now we see companies from the civil society join our association: financial institution CDC, insurer AXA, even the National Automotive Council joined us recently. At the beginning, there were only large groups and highly specialized companies. Today a number of other actors and the automobile industry have joined us because they feel the market will emerge. Has the French Government decided to add hydrogen into the national plan of alternative fuels? The important achievement of this year is the law “for the energy transition and green growth” which was promulgated on August 18. Its section 121 is entirely dedicated to hydrogen. It is written that France will provide a plan for hydrogen applications within one year. This plan should be articulated on two parts: the development of hydrogen refueling infrastructure and testing of large-scale energy storage systems based on hydrogen (in particularly power-to-gas projects). Therefore, that is something that is going right now, because the plan has to be ready on August 18, 2016. This is an important step in the commitment of France on hydrogen technologies. Second point: in the national plan “Industry of the future” hydrogen is clearly indicated as the main component of ecological mobility. This plan includes a commitment to have 1000 hydrogen vehicles and 100 of hydrogen filling stations by 2018. Come to see more on the open-air free exhibition “Paris de l’Avenir” on Quais de la Villette in Paris. The exhibition will work till December 14 2015. How do you see the future of the hydrogen industry in France? We must understand that today the technology is ready and there are products available on the market. In France, we have very big players like Air Liquide, Engie, EDF, which are working in this field and we have a whole set of technological companies offering services and products. What is lacking today is a sufficiently profitable market with volumes that can justify the positioning and investment in terms of industrial capacity. This is a necessary condition to have the costs of these products decreasing. I think activity will start with the initial markets in mobility applications, first with development of vehicle refueling stations together with electrolysis and storage technologies. These steps will generate the demand for products and production will begin to rise in volume. You should know that today the water electrolysis systems are almost handmade: there are around fifteen companies in the world that manufacture electrolyzers. They are still assembling their systems manually. With the anticipated volume growth by 2030 this industry will become automated, which will transform the industrial landscape in this field. Therefore, the first start is happening through the automotive markets. There is another growing field – this is hydrogen injection into natural gas networks. It will help to recover any excess of electricity, turn it into hydrogen and mix it with natural gas. This method will use natural gas networks instead of electric networks to ultimately optimize the energy transport network. This is so-called “Power-to-Gas”. Germany has made a good progress in this field and now it starts to appear in France: The first project was in the Dunkirk region, which was contracted last year and will be in operation in 2017. There are other important projects in the south of France, at Fos-sur-Mer, which was recently announced by the GRTgaz. This is a 1 MWh Power-to-Gas project to demonstrate this kind of technology in a large-scale. Projects of such types will boost the market for electrolyzers. There is one scenario made by GRTgaz, which predicts that by 2050, France will have 70 TWh of wasted renewable energy. Using hydrogen technologies, we can recover it. If we want to transform 30 TWh in 2050 using Power-to-Gas methods, by 2030 we should already installed 3 TWh of such systems. This will require installing 600 MW of electrolyzers. This is equivalent to 600 systems similar to those at Engie at Fos-sur-Mer. This is a very big number. Such developments will boost the hydrogen sector. Viacheslav Zgonnik, UAHE. My personal thanks for Charles Odendhal for proofs of the text.